So with all these ideas, why the lack of follow through? I allow myself to get completely overwhelmed. Then I allow negative thoughts to take over and I simply talk myself out of whatever the idea was. I think the key word is "overwhelmed." It's easy to think too far ahead, to eye the big picture rather than take everything in bits and pieces. I tell clients to make mini-goals, but I don't do this for myself quite often. But that doesn't mean I've completely failed. 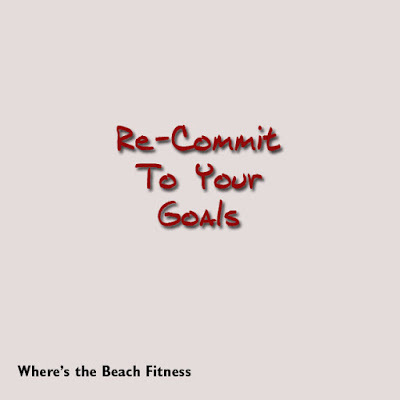 It simply means it's time to re-commit to my goals, my current goals. I think it's so easy to allow ourselves to get so overwhelmed that we basically freeze up. Throw up our hands and declare something impossible. But I'm seeing that it's not impossible. It's a cop out really. But if you want something, if it's truly worth having, then you'll work for it. You'll find a way to make it happen. And that may mean a little goal changing and re-committing. And that's perfectly ok. So let's start going for the things we want shall we? Who's ready to re-commit to something today?